Our next Screen Talks event will be on Monday 9th March, 6.15pm at Exeter Picturehouse. Dr Florian Stadtler, Lecturer in Global Literatures and Cultures, Dept of English and Film Studies at the University of Exeter) will introduce The Lunchbox (Ritesh Batra, 2013). Join the event on Facebook and find out more here. Booking Information: Book online, call the Box Office 0871 902 5730 or buy tickets on the door (half price for students on Mondays). Florian has written a guest-blog post for us on the film: What happens when a lunchbox delivery from a housewife’s kitchen in the suburbs of Mumbai/Bombay into the bustling business district of the city goes wrong? This is the premise of Ritesh Batra’s evocative 2013 film, The Lunchbox. This unusual mis-delivery leads to the unexpected connection of Saajan (Irrfan Khan, known to many in his roles in Slumdog Millionaire and Life of Pi), a reclusive and bad-tempered office worker close to retirement, and Ila (Nimrat Kaur), an unhappily married suburban housewife. Both are pleasantly surprised. Ila sees her food appreciated by this stranger, putting into sharp relief the indifference of her husband. Saajan, still in mourning for the death of his wife, too, discovers a new perspective on life, which is facilitated by the exchange of notes delivered in the lunchbox. The premise for the film is an unlikely one. As a 2010 Harvard Business School Study led by Stefan Thomke revealed, the error rate in a lunchbox delivery going wrong is one in six million. But the film imagines this ‘what if’ moment. The film is marked by tender performances, particularly by Khan and Kaur, but the film also distinguishes itself through a documentary sensibility that evokes the intermediary role fulfilled by the dabbawallahs, the men who provide the daily lunchbox delivery service. They bridge the space of the domestic urban with the public open-plan office in the heart of the city. These cross-flows that traverse the private space of the home and the public spaces of the city and the office workspace reveal the intensity of the city with great sensitivity and attention to detail. The dabbawallah’s position in-between is underscored by an observing, detached camera eye. They remain almost a voiceless presence, except for the end, when Saajan listens in on their singing on the train, and for a brief exchange between Ila and her dabbawallah. Indeed, this depiction of the dabbawallahs is not accidental. Ritesh Batra began researching the lunchbox delivery service in Mumbai in view of making a documentary in 2010. He developed the script for this fictional story concurrently. In the event the documentary did not get made. Yet their service is key to the unfolding of the story. The dabbawallah’s work and their presence in the film is marked by a deliberate switch from narrative driven fiction film-making into documentary to offer a close-up on Mumbai’s everyday middle-class city life, characterised by suburban train journeys and office work. Mumbai – one of the largest cities in South Asia and the financial capital of India – is almost a character in her own right in the narrative and the film manages to give a sense of the city, particularly through its depictions of crowds and the individual’s navigation of spaces. 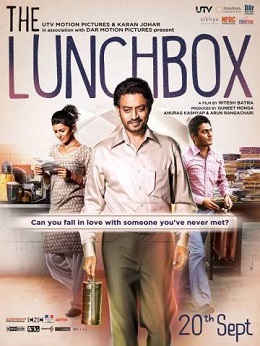 While the lunchbox delivery service is a crucial plot point around which the narrative revolves, the film is centred on its three main protagonists who are all faced with a crisis in their life. Ila seeks solace in her cooking to change her life; Saajan dreads his imminent retirement and plans to move to Bhutan and the orphaned Shaikh seeks guidance from Saajan to find his place with his new wife as a new arrival in the city. This is a film of ideas. Unfolding its narrative slowly, Batra seeks to think through the different possibilities, life choices and regrets that the three main characters have to confront and relies on the imaginative truth incorporated by the actors in their performances. It is marked by a local specificity, reminiscent of the novels of Orhan Parmuk’s Istanbul, and the film, at moments, almost seems like a poetic and literary love song to Mumbai. Batra has cited both Parmuk and Czech novelist, Milan Kundera as important influences on his work. But Batra’s script and filmic sensibility also owes much to the literary sensibility of Latin America, particularly, Argentinian writers, Jorge Luis Borges and Julio Cortázar. The narrative is character- as well as story-driven and dramatizes the conflicts between tradition and modernity, individuality and family that arise in new configurations and opportunities created by living in the city. Linguistically, the films navigates the axis of Hindi and English, which remains true to the educated, professional middle-class milieu the film describes. The film at times almost achieves poetic qualities, through the way in which the camera frames the domestic homes and workspaces. The axis on which this is developed is the position of Ila whom we see for the majority of the film inside her kitchen and the home, virtually imprisoned. This position is only enhanced by her relationship with the anonymous ‘Aunty’, who lives above her, whom we only encounter as a disembodied voice. The emerging relationship between Ila and Saajan flourishes through their shared feeling of entrapment. Saajan is imprisoned by his past; Ila, by her marriage. Ila, though perhaps a victim of her circumstances, is a strong character and the epistolary relationship between the two works because of their shared experience of loneliness at different stages in their life. What we witness, then, is two people sifting through the baggage of their lives who are brought together by the impromptu exchange of notes triggered by the miracle of the mis-delivered lunchbox that connects these two people. Shaikh partakes in their story and his own life is one of reinvention and survival, against the odds, and of making the best of the opportunities offered to him. His resilience is characterised by his ability to change and evolve, much like the city of Bombay has over the centuries. The film is knitted together by the strong connective bind that are the dabbawallahs and their extraordinary delivery system, a system that is organic to the city, that works by an intricate code of numbers, letters and colours so that the lunchbox arrives at the right place, at the right time. The Lunchbox and its national and international success reflect the burgeoning scene of independent filmmaking in India, which has experienced a resurgence in recent years. It is a wide-ranging co-production that includes financial backing from Bollywood production houses as well as international backers from France and Germany. It involved DAR Motion Pictures, Rohfilm, Cine Mosaic Productions, ASAP Films, Sikhya Entertainment, ARTE France Cinéma, National Film Development Corporation (India), Medienboard Berlin-Brandenburg and was distributed in India through Bollywood film producer and director Karan Johar’s production company Dharma and the Disney-owned UTV. It launched in Britain at the British Film Institute’s London Film Festival in 2013 and enjoyed a UK-wide release in Spring 2014. Dr Florian Stadtler researches Indian Popular Cinema/Bollywood, South Asian writing in English, particularly the work of Salman Rushdie, and British Asian Literature and History. He has published in these areas. Find out more about Florian’s research here.